Chromey Visits The Darkside With Chord Electronics New DAC. Says, "I'm no longer the Qutest anymore". 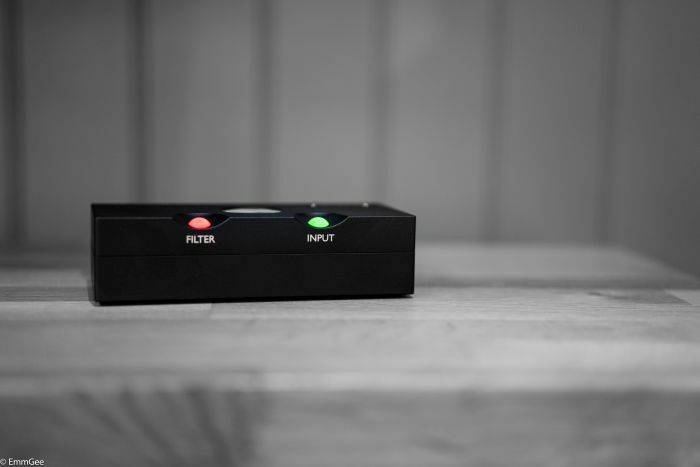 Chord Electronics have done it again, developing and extracting atomically accurate detail from a respectably priced digital to analogue converter (DAC). Utilising the brand new Hugo 2 chip, stripping out the headphone amplifier and battery but leaving the lush sweet sounds we expect from Chord Electronics that will challenge any DAC north of £1000. (But not you Chromey, the Qutest is your friend, read on little guy and we'll explain why). 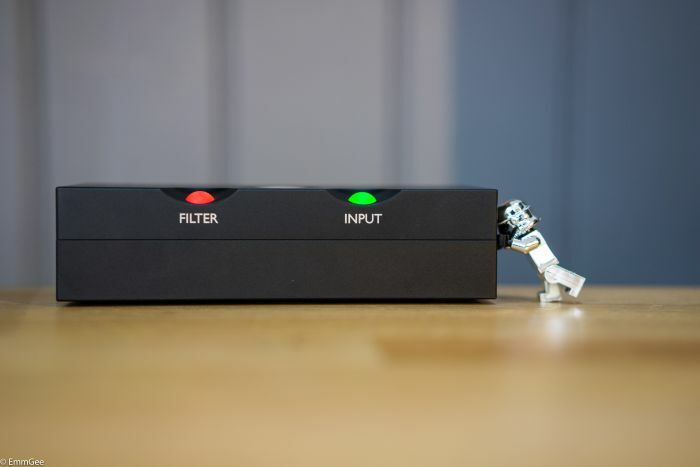 Chord Electronics have also added a dedicated audio filter and input switch on the front, more akin to the Mojo and Hugo 2, the previous 2Qute had a switch on the rear panel to change your inputs. The dedicated audio filter is for those who like to tweak the audio a little bit. Ahhh, you see Chromey, we new you would "opt in" in the end. New look, new you! Chord have changed their styling, opting for their signature 'coloured marbles' for the controls, much akin to the Hugo 2 and Mojo, and a much more angular, muscular look. (Yes Chromey, a bit like you). For our listening test, we took a modest system similarly priced to the Qutest just to see if we could add a little Chord magic dust to it. We implemented a Qutest into a Rega Brio, Dynaudio Emit 10 and a Bluesound NODE 2. Connecting the Node 2 via Coaxial out into the Qutest and then RCA analogue into our Rega Brio. Playing a mixture of Hi-Res, MQA and 16bit CD with completely mesmerising results. 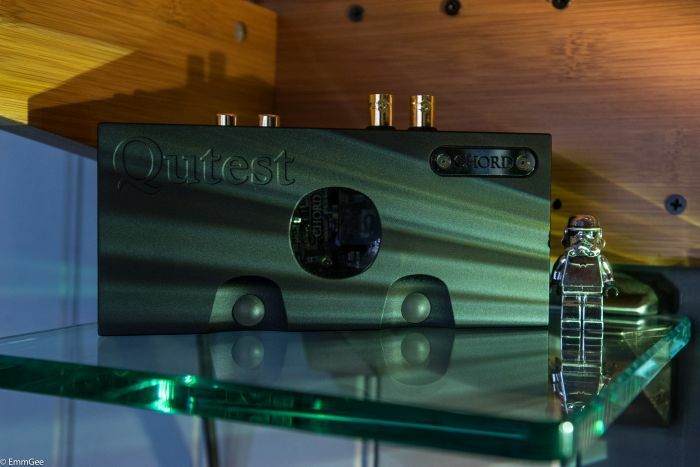 Dropping the Qutest into our system immediately opened up the soundstage, detail, bass and just made the music "life like" in comparison to hearing it before the Qutest was introduced, we simply couldn't go back to the Brio and Bluesound without the Qutest. You can hook it up to such an array of systems. It sounds amazing with a Rega Brio amp with a pair of Dynaudio Emit's and even better with a Naim Nait XS2 or Rega Elicit-R amplifier paired with Neat Motive SX1's, basically the Qutest is never lost in a system. Moreover, it stands there with it's chest out demanding your attention. Come in and have a listen at Audio T Manchester. Chromey has seen the light...will you?